A demonstrator holds a sign that reads "Brexit: Is it worth it?" 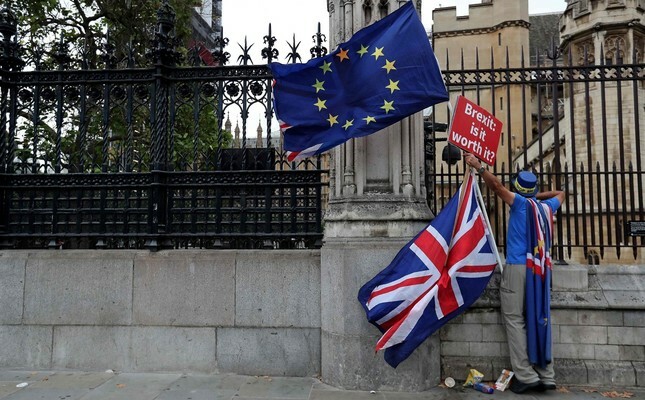 while waving an EU flag, as he protests outside the Houses of Parliament in central London, Sept. 11, 2018. Brexit talks have reached crisis levels. Now more than ever, the opposition in Great Britain is aware of how dreadfully unprepared the country is for leaving the European Union. Disorganized and disunited, the Conservative Party does not know how to draft a road map out of the EU. No matter how much Great Britain wants to leave the EU, the latter is not a simple contract you can just tear up and move on from. In reality, Great Britain is integrated into the bloc through a very complex web of ties. Goods, labor, services and capital are currently circulating freely. There are no limitations on property rights, which has resulted in foreign ownership of a sizeable part of British industry. By "foreign ownership," the EU understands "non-EU partner's ownership." This is perfectly logical as long as a country stays in the EU; however, what would happen if it chooses to leave? Goods are can circulate freely within the EU, a must for establishing any common market. Therefore, production remains "local" so long as the goods are of EU origin. What will happen to processed goods once the U.K. pulls out of the EU remains a total mystery. The origin rules of international trade are bound to create turmoil in the markets. Labor representatives would like to have a customs union with the EU and access to its single market. A little bit like the Turkey's present situation, but with more common ground, most probably. British Prime Minister Theresa May's government does not wish to keep a common customs tariff – therefore, no customs union. Most of the time when questioned about the details of Brexit, government representatives respond with extremely confusing, mostly slogan-based answers. The negotiation period is heading directly toward a wall. More and more a "hard Brexit" means the U.K. leaving the EU without a proper agreement in place. EU representatives, on the other hand, are caught between their regulations and a deep resentment of the U.K., which has placed the EU in a difficult position. In view of the British attitude within the EU for 45 years, the European Commission is definitely not motivated by a sentiment of gratitude toward the British. For years, the U.K. has taken every occasion to express its derogatory attitude, to denote its difference and its peculiarity in the EU, sometimes for no valid reason. Now the time for revenge has come. Despite all the measured and moderate tones employed by Michel Barnier, the EU negotiator for Brexit, the European Commission is not going to make things easy for Great Britain. It is no longer an amicable separation; it is turning into a real feud between the U.K. and the EU. The more the opposition in the U.K. learns, the more they are alarmed. Nonetheless, they are what they are, an opposition party, fearing a comeback staged by the U.K. Independence Party (UKIP). They have limited influence on the outcome of the negotiations. The Tory government will most likely pay a high price for having underestimated the popular reaction against the EU and having organized a bizarre referendum. The Labour Party, loyal to its always-distant attitude toward the EU, is paying the price for its relative lack of motivation during the referendum campaign. However, it is too late. It would be very wise for the EU to show more understanding to the U.K., just as it would be very wise for the Tory government to be more accommodating. Brexit will happen; its negative effects will not deter its supporters or any populist activists or politicians. It will be a formidable weapon in the hands of the anti-EU proponents and something each party should contemplate before a nonagreement becomes unavoidable.